Studies continue to show that a Jewish overnight camp experience is the greatest indicator of a connection to Jewish identity throughout life. 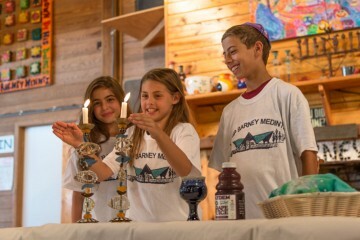 Here at Camp Barney Medintz, we inspire and solidify your campers connection to their Jewish heritage, creating a lifelong connection to Jewish tradition. Jewish customs, traditions, and culture are woven into every day camp life at Camp Barney, instilling in our campers a lifelong connection to their Jewish identity. For more than 50 years, our campers have enjoyed Jewish music, learning about Israel, Israeli dance, and Israeli culture, saying the blessings before and after meals with the entire camp, and special programs like Israel Day. 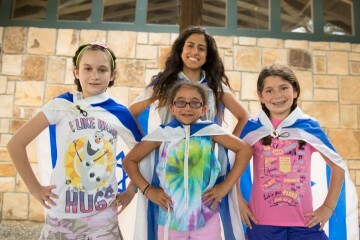 Jewish life is an integral part of the everyday magic of Camp Barney Medintz. 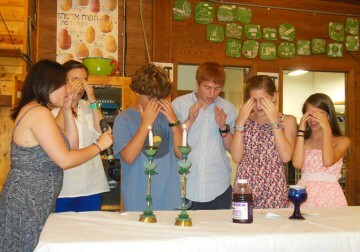 Shabbat is a special time, one that campers will remember and recall long after their camp days are over. There is the Camp way we sing the prayers in the Zaban Chapel overlooking the lake, with the voices of 700 other campers surrounding us. There is nothing like it and our campers don’t forget that feeling. The whole Shabbat experience offers a sense of ruach and spirituality, from getting dressed up on Friday nights to the special Shabbat dinner. On Saturday, whether playing basketball, playing cards, swimming in the lake or splashing in the pool, our campers know it is Shabbat, a day of peace and relaxation. We all join together again on Saturday nights to conclude Shabbat with Havdalah.